I often copy my chunk file on to GP application folder as part of my development work, so I must keep two explorer windows open always. 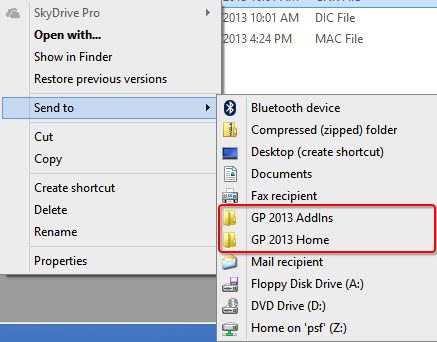 Copy from my development folder and paste it on to GP application folder. Difficult and frustrating (at times) to shuttle between two folders every time. Just select my chunk file from my development folder, invoke Send To menu and send it straight to GP application folder. Awesome, isn’t it? It is, indeed. It saves almost 15-30 minutes a day depending how many times you perform copy paste with same source and destination folders. Follow the steps explained in this blog post: How to add SkyDrive shortcut into your ‘Send To’ Menu. The post discusses on how to add a shortcut for Skydrive, but it’s the same steps that you have to follow for any shortcut (internally on your computer or an external location). I assure you that this trick alone would save you tremendous amount of time and effort in a day. This entry was posted in Off-Topic, Tips, Windows, Windows 8. Bookmark the permalink.